Until recently, there weren’t many options when it came to intermediate textbooks for learning NT Greek. The most well-known was Daniel Wallace’s Greek Grammar Beyond the Basics, which is more of a reference work than something you’ll want to casually read. However, the past year has seen several new grammars published for NT Greek students continuing their studies. One such options is Going Deeper in New Testament Greek by Andreas J. Kostenberger, Benjamin L. Merkle and Robert L. Plummer. If you’re only looking to refresh the basics and learn the paradigms, you need a beginning grammar. What this grammar does provide, however, is a more systematic explanation of the grammatical and syntactical concepts that are only more generally covered in an introductory text. This will not necessary by itself improve your reading ability, but will help you analyze scripture and understand the various nuances of use for a given case or tense, for example. This textbook was clearly designed to be student friendly. This is not just a reference book, although you can undoubtedly use it that way. In the beginning of each chapter, your interest is captured with an exegetical insight related to the chapter topic in a section called “Going Deeper.” After seeing why the concept is relevant for exegesis, you are then brought through the standard grammatical explanations. Thorough examples from scripture are given for each point. The concepts are summarized at the end of each chapter in a easy-to-understand chart. This is followed by vocabulary lists, a selected NT reading and corresponding reading notes that explain the grammar in each verse. This integrated approach ensures you understand the value of concepts before learning the concepts in depth. And after you’ve been exposed to full-breadth of material, everything is again summarized and applied directly to scripture. 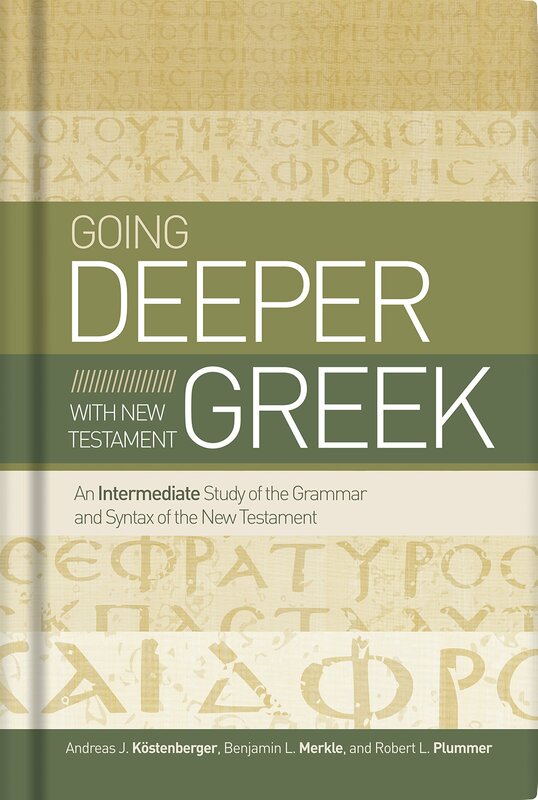 Going Deeper in NT Greek has all the content you’d expect from an intermediate Greek grammar, and then delves into some other helpful guidance for those who actually want to use their Greek knowledge. In addition to the chapters addressing the standard grammatical components of Koine Greek, there are chapters covering textual criticism, diagramming, discourse analysis, and word studies. For someone who wants to apply Greek within ministry and biblical studies, these are quite helpful. Regarding its aesthetic qualities, this textbook is well-organized, has good font sizing, clear titles, and so forth. They have seem to have cut costs by placing the text too close to the gutter, while also printing on cheap paper. None of this seriously affects its practical usefulness, of course, so I suspect was a deliberate decision to lower cost/increase profitability. The title is quite appropriate. 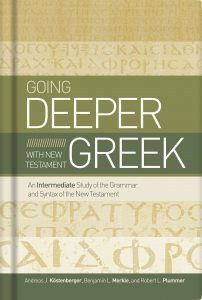 For those who’ve already mastered the basics and want gain deeper understanding, Going Deeper with New Testament Greek is definitely a helpful and recommended resource on your journey. To learn more, BH Academic has a website devoted specifically to this textbook. You can find a 50-page excerpt, as well as a number of ancillary resources including PowerPoint slides, quizzes, and faculty resources.